This spring, the Donguri Kyowakoku Ghibli Store is teaming up with Japanese tea brand Lupicia to produce a couple of limited-edition tea blends and containers starting April 13. They’re based on scenes and characters from My Neighbor Totoro and Kiki’s Delivery Service, two of Studio Ghibli’s most popular films. This spring’s Totoro tea is a blend called “Rooibos Dandelion.” One limited-edition design can of these fragrant leaves will cost you 1,800 yen . The lid of the can features an image of big, medium and small Totoro surrounded by cheerful yellow dandelions. 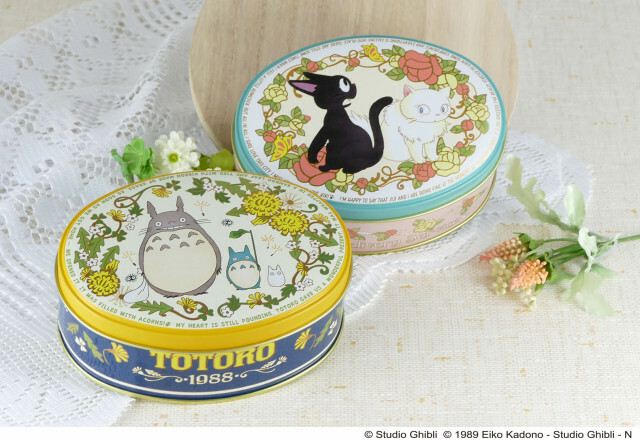 The can itself, colored blue, is decorated with more dandelions and the word “Totoro”, along with the date “1988,” also known as the year that the film My Neighbor Totoro was released. The tea itself is a blend of green rooibos and corn, inspired by the gift of corn that the character Mei gave to her grandmother in the film. The Kiki’s Delivery Service collab tea features the two lovebirds–or should we say love cats?–Jiji and Lily. It captures the first glance they had of each other, which led to one of the film’s cutest romances. This blend is called “The Rose Garden,” (also 1,800 yen) displayed by both the border of roses on the tea can’s lid and the blend of tea itself. The side of this tin is a pastel pink with a line of roses and butterflies, along with the film’s title. The tea included in the tin is a blend of vanilla-and-fruit-scented black tea with real rose petals inside. The tea will be available exclusively on the Donguri Kyowakoku online shop and in the Donguri Kyowakoku Sora no Ue shop on April 13 (though reservations have already started on the site), and Lupicia will release a limited quantity as well, starting April 15. Will you be getting yours too? Will There Be Spirited Away 2?